It’s a vicious cycle that can cause mental distress and even wreak havoc on your physical well-being. Believe me, I know! I’ve been there. And I’m still working on it. 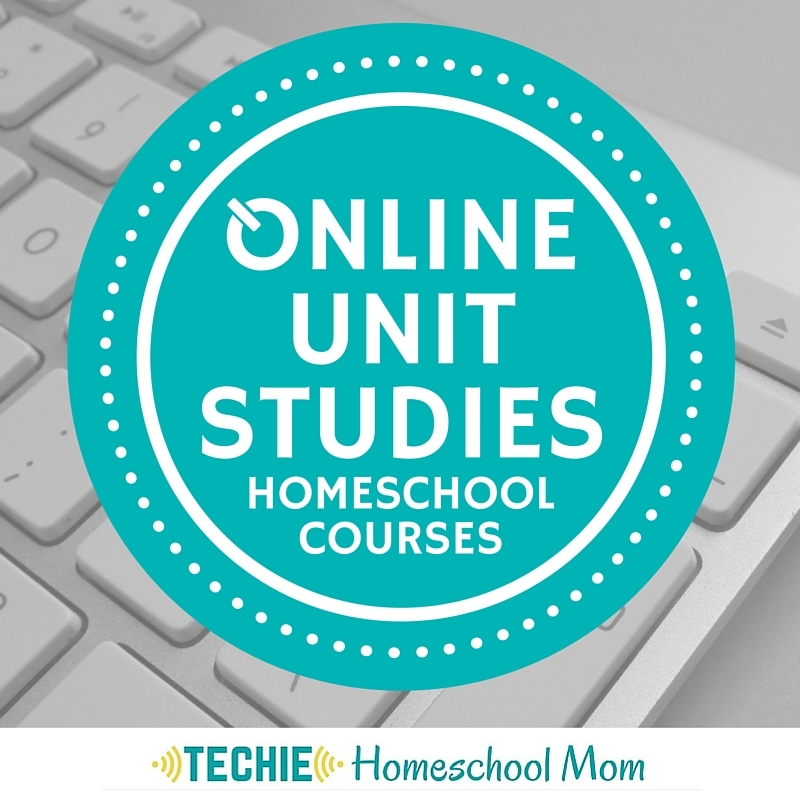 *Note: this post contains affiliate links. We may receive a small commission (at no additional cost to you) if you choose to buy something. The reverse is also true. When you experience an exorbitant amount of stress during the day, it causes you to lie there awake – and that piles on more stress for the upcoming day. For me, it seems like my body will shut down during the day due to the added pressure, and then I will be awake at night. The Huffington Post conducted a poll recently where they asked people what their #1 stressor was. Lack of sleep was one answer that dominated the results. Stress and lack of sleep combined can cause you to lose mental clarity and can put more pressure on your body to perform at less than optimal standards. 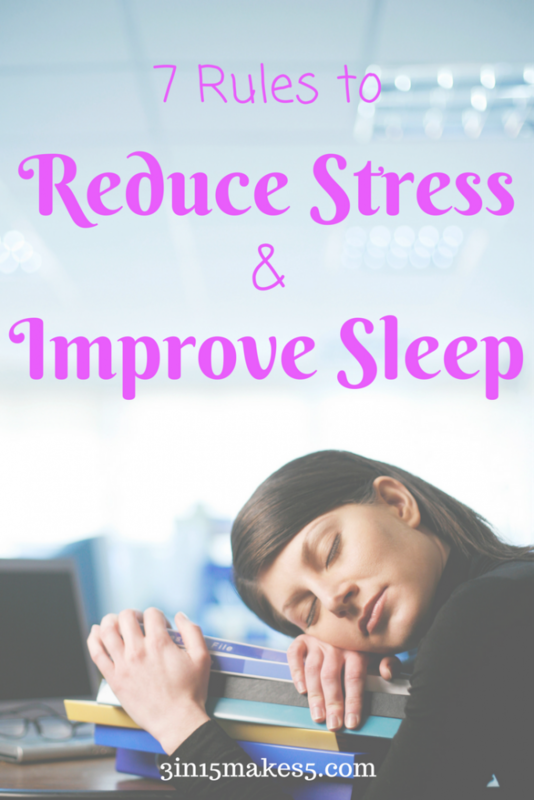 It’s vital that you learn how to implement stress relief measures that also work to lull you to sleep at night. When you wake up fully refreshed, you’ll be able to tackle the world and anything it throws at you! It is recommended that you get 7-9 hours of sleep a night. Do you fall in that range? If you are suffering from stress, the likely answer is no. 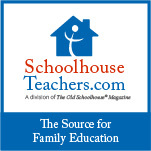 I’ve been known to get 3-4 hours (or less), and that was even without interruptions from the kids when they were younger. According to a Gallop poll in 2013, the average American slept 6.8 hours a night. That’s down more than an hour from 1942! And 40% get less than the recommended 7 hours. These are things that sound simple, but with anxiety, it is an ongoing process. Don’t beat yourself up. Take it one day at a time. Would you like a copy of the 7 Rules? 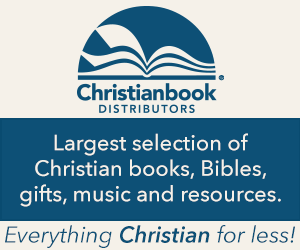 Request your list today! Some people have their computer right beside the bed, and the glow of it lights up the room at night. Same for notifications that come in on cell phones – sometimes with lights and sometimes with the inclusion of sounds. Not only is it a physical factor, but it causes a certain amount of mental unrest when you’re always checking emails or looking to see who posted what on Facebook. Technology doesn’t just have to be left out of the bedroom – it needs to be shut down before you go to bed. Your mind needs time to disconnect and wind down itself, and it can’t do that if you’re constantly feeding it information. If you go to bed at 10 PM, try disconnecting around 8:30 PM. Let your stress melt away, and your mind relax. This isn’t an easy habit to break, but you’ll be able to implement it – even if you do it in baby steps, such as not taking it in the room with you, but using it right up until bedtime, and gradually creating a routine that’s beneficial for your health. If you do need a device, consider getting something that allows you to change the lighting. The Kindle Fire uses Blue Shade, which can adjust the backlight, so it’s not so bright. An iPad offers similar features. I have used both in the past for night-time reading, but I usually use the Kindle Fire. I have to admit; I was a little leery about this one. Strong smells give me migraines. However, I have been able to tolerate essential oils, just a few drops in a diffuser (not the 5 or more some recipes recommend). 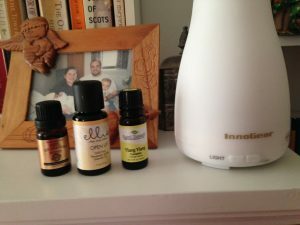 We have two diffusers, one in our bedroom and one in the family room. It might be a good idea to get a starter kit which will give different essential oils to try. 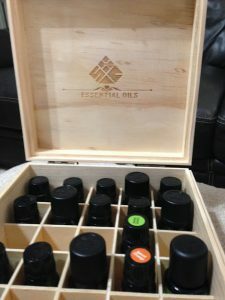 Don’t forget a box to keep all the essential oils. Many of them need to be stored out of direct light. Here is the one we use. What’s the best way to use these to unwind and get better sleep? You have many options when it comes to aromatherapy. You can use candles, diffusers, wall plugins, and more. Some people like to create or buy a special mist that they can spray on their pillows at night (or put on their wrists) before bed. It sounds almost backward – putting forth extra exertion when you really need to be relaxing and calming down. But that’s just what exercise does for you! Exercise is a great stress reliever because it helps you release endorphins. Sometimes you hear of athlete’s bragging about their “runner’s high” – because although they may start out fatigued, they hit a point in their regimen where the endorphins are released, and they feel good. Happy-Go-Yoga is a book providing yoga poses to help minimalize your stress. It offers ways of doing yoga at home, office, anywhere. As you might suspect, the harder you work out, the harder you snooze each night! If you’re not used to exercising, start out slow and work your way up. You can start off with a simple 10-minute-a-day plan and increase it a bit each week. Also, check with a doctor before starting a new exercise routine. The side effect of exercising to get better sleep and stress less is that you might shed pounds if you’re overweight! Poor sleep makes people gain weight according to recent studies – and stress is a definite factor in consuming too many calories. For some people, bath time is their only time of the day when they unwind and kick stress to the curb. There are no clocks ticking, no technology vying for your attention, and nobody talking to you. It’s just you, your warm, soothing water, and whatever environment you’ve created to help you relax. The setting for your bath meditation is just as important as the sleeping environment you create. A cold, sterile bathroom won’t lend itself to a calming atmosphere. You can use bath meditation whether you have a 10-minute bath or an hour-long bath. I remember it was such a luxury to have a soak in the tub when my boys were little. And I always seemed more relaxed afterward. Some people like to incorporate aromatherapy during their bath meditation – and you can find candles, bubble bath, or essential oils that soothes you with lavender or chamomile or any other scent that calms, rather than invigorates you. 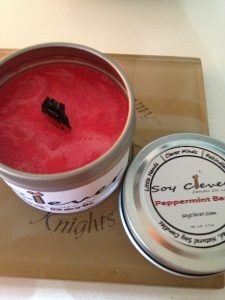 We love using Soy Clever candles, which are paraffin free. The scent is not overpowering like so many other brands. As a family company, they make the candles themselves in small batches, ensuring a quality product. Music is another option for you to consider. You can choose soft, relaxing music – or even invest in some guided imagery CDs that will walk you through a visualization process that helps you meditate while in the bath. Just as you’ve committed to turn off technology at bedtime, do the same for your bath time, too. You can’t really relax and meditate if your smartphone is ringing off the hook. Leave it in the other room. Make sure that when you ease yourself into your bath, you start to get familiar with how you’re breathing. Most people go through each day using shallow breathing, and it’s deep breathing that cleanses the stress from your body and helps you sleep better. Let your mind wash away all the troubles and irritation of the day – picture it washing out to sea – and replace it with happy thoughts. 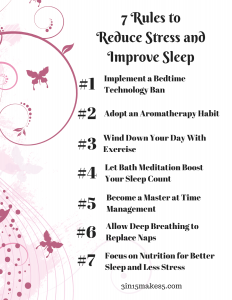 During the Huffington Post surveys about sleep and stress, they noticed that most people started with phrases like, “Not enough time to…” Time is one thing we need more of, and we have less of in this day and age. We have no time to relax. We push ourselves from the time our feet hit the floor in the morning right up until we go to bed – and we never get to bed on time. Instead, we give ourselves a minimal amount of sleep hours – and much of that is spent tossing and turning due to the stress of what all we couldn’t accomplish in the day. Notice I didn’t say, “free up more time to get tasks done.” Many of you will learn new time management skills and forget to learn your lesson about sleep. Instead, you’ll pack in more on your to-do list. Keep a diary or journal of your daily routine. (See our post about our favorite Bullet Journal products.) Notice all the times when you’re surfing the web or standing around chatting with co-workers. That’s time that you could be spending accomplishing things so that once your day is done, you are rewarded with free time – “me time” – to pamper and nurture your body and mind. You might also find that when you implement the other rules here, along with proper sleep hygiene, you’ll be able to get more done throughout the day. That’s because your mental clarity improves and you tend to have more energy to tackle whatever the day may bring. Going to bed for 2-4 hours in the middle of the day is a recipe for disaster. You’ll never be able to go to bed at a regular bedtime, and you’ll lie there frustrated and annoyed that you can’t go to sleep. It’s a hard habit to break. Try using deep breathing to energize yourself whenever you’re in an afternoon slump. Breathe from your diaphragm and try to watch how often you’re using shallow breaths throughout the day. Deep Breathing Exercises for Anxiety explains how to breathe deeply and gives examples of quiet, effective breathing. Get up and walk around. Sometimes you just need to change your position or environment, and it will help rejuvenate you. Drink some water. When we are dehydrated, it can cause us to be fatigued. Make sure you are getting at least eight glasses a day. Foods are one area where what you eat can benefit or damage both your sleep and stress levels. If you want to alleviate stress and get better sleep, you need to limit or avoid alcohol and caffeine (including chocolate), and eat foods that will help with both! That means eating good protein like turkey or lean chicken, salmon, avocados, nuts like almonds or walnuts (unless you are allergic, like me), and apricots (which soothe your muscles). Regular meals are essential, too. You want your blood sugar levels stabilized so that you don’t have to deal with mood swings and energy highs and lows. Having some form of protein at every meal or snack will help with this as well. 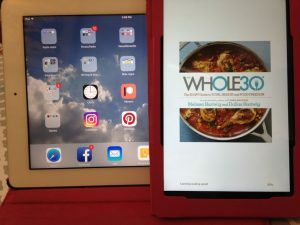 The Whole30 program showed me how much gluten has been affecting me. I would highly recommend it to anyone. 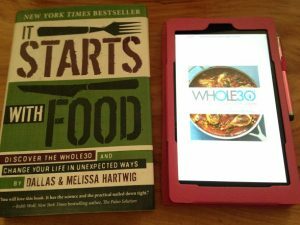 Their books, The Whole30 and It Starts With Food, do a good job of explaining the science behind the food. There are reasons why certain foods cause inflammation, and certain foods help with digestion. But keep at it. Slowly, but surely, you will see changes. Will you get discouraged? Probably. Want to give up? Definitely. But don’t! You owe it to your health to not just try but to succeed.